Safford, AZ - March 9-10, 2016 His Grace arrived in the late evening of Wednesday and was joyfully greeted at the airport by two of the sisters. Upon reaching the monastery, he was escorted to his guest quarters under the silent, magnificently starry desert sky. In the morning, His Grace served the Hierarchical Liturgy. After the Small Entrance, His Grace performed the Service of the Tonsure into the Rassophore for one of the sisters, now newly-tonsured Sister Syncletica. As a special gift, he presented her with an icon of the Theotokos, depicted with a very sweet countenance, painted by his own mother. For the Liturgy, there were four priests serving with His Grace in the sanctuary. One of these priests was spending the week at the monastery along with 23 people from his parish in Colorado. They were all delighted to participate in the joyous event of His Grace’s presence in the monastery. The Gospel passage appointed at the Liturgy was from St. Luke’s account of Christ’s Passion. His Grace gave an edifying homily on the text, pulling from the Old Testament prophecy that the reproaches of all would fall upon Christ. His Grace reminded the newly-tonsured Syncletica and all the sisters, that we are to bear (not just tolerate) one another’s infirmities and weaknesses. He also spoke a word about receiving Holy Communion, emphasizing that Holy Communion is not just about receiving God, but also about receiving our neighbor, our sister, our brother. He added that this dimension of caring about our neighbor is disappearing, emphasizing how important it is that we receive one another. After the Liturgy there was a formal procession to trapeza, where a sister read from St. Maximos the Confessor’s First Century on Love. Shortly afterward, all gathered in the sisters’ Konakion for an engaging class by His Grace, on the topic of Pleasure and Pain, as expounded by St. Maximos. During the free hours of the day Abbess Michaila shared with His Grace the architectural plans for the small Archangel Michael cemetery chapel and showed him the icons that have already been completed. He was likewise shown photographs of the progress of the Platytera and Communion of the Apostles frescoes which are in the process of being completed. His Grace was pleased with the progress. 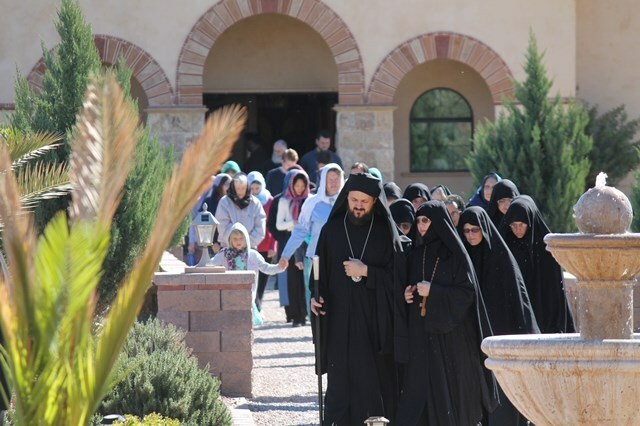 Abbess Michaila then escorted His Grace to the newly developed Bookstore, and then to the monastery’s “Prep Room.” Large drums of curing olives were opened for His Grace to sample the various olives, harvested from the monastery’s olive trees. The sister who oversees the harvesting and curing of the olives showed His Grace the small olive press, briefly explaining the process for pressing the olives into oil. His Grace also saw the many vats of wine (grape, pomegranate & cactus), and the sister who crafts the wine shared a few words with him about the process. There, in that same Prep Room, he likewise saw the equipment for processing goat milk, and also the handmade goat-milk soap which the sisters are making. His Grace happened to be near the bell tower before the afternoon service and joyfully watched the sisters sound for the services, with the kobano, the sidero and the bells. At the conclusion of the Lenten Vespers Service, during which His Grace presided on the throne, he said the beloved Prayer of St. Ephraim, which was as if bestowing his archpastoral blessing on all those present, for the approaching days of the Great Fast. Abbess Michaila was particularly pleased at being able to provide a short but refreshing respite for His Grace from the many burdens of His episcopal ministry. His Grace had emphasized during his talks that in our post-modern times we fail to see the value of time shared together, in cultivating relationships with each other. The journey back to the airport reflected this treasured time of sharing with one another. While riding in the car, His Grace also partook of the beauty of the hand of the Creator, seeing the orange hues of sunset, and spontaneously chanted the ancient hymn “O Joyous Light!’ It was a fitting conclusion to a day abundant in blessings.